Pharmaceutical researchers are becoming more interested in the use of three-dimensional printing (3DP) to manufacture medicines. Since 3DP is a highly flexible technique to manufacture personalised objects, 3DP can potentially become a new method to fabricate patient-tailored printlets (3D printed tablets). Different 3DP systems have been explored for their use in Pharmaceutics, including fused deposition modelling (FDM), selective laser sintering (SLS), powder liquid and recently stereolithography (SLA). SLA has some advantages over other types of 3DP, mainly its remarkable resolution and the avoidance of thermal processes which can be detrimental for certain drug molecules. 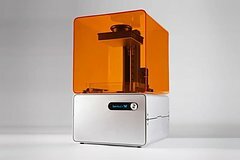 Stereolithography (SLA) 3D printing is an additive manufacturing process where a photocurable liquid resin is solidified in a highly accurate, controlled and rapid way. 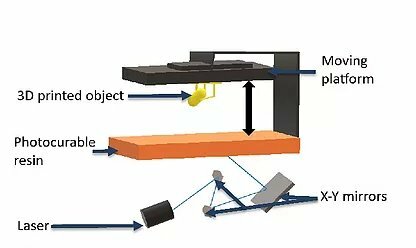 In SLA 3D printing the solidification of the building material occurs in a layer by layer manner by means of a photopolymerisation process. During photopolymerisation, 3-dimensional crosslinked networks are formed upon exposure to an appropriate source of light which allows the possibility of fabricating hydrogels. 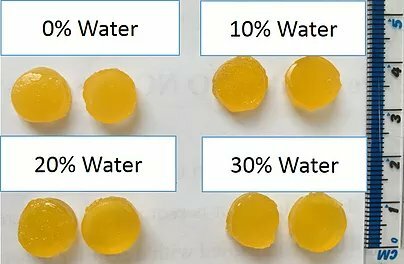 Hydrogels are three-dimensional hydrophilic polymeric networks, which are able to absorb large amounts of water or other liquid agents hence having gel behaviour. This property makes hydrogels great candidates for their use for biomedical purposes, for instance in tissue engineering and in drug delivery systems. The use of hydrogels as medicines allows the possibility of having a controlled release of drugs over time from these polymeric matrices which is desirable to enhance efficacy and safety. Researchers at the UCL School of Pharmacy fabricated for the first time ibuprofen-containing hydrogel printlets using a highly biocompatible photoinitiator (which is a molecule capable of initiating a light-triggered polymerisation process) and a commercial desktop SLA 3D printer. The hydrogels had different contents of initial water in the liquid formulation to modify the speed at which the drug is released from the printlets which can be useful to tailor drug release profiles to the individual needs of patients. How is the drug contained in the printlets and how is it released? During 3D printing the drug becomes entrapped in between the polymer crosslinked network. When the printlets are placed in water, they swell as the network loosens. When this happens, the drug molecules are released in a controlled manner. Depending on multiple factors including how tight the polymer networks are, the drug release can be modified, in this research since the hydrogels retain the water added prior to printing, this acts as a pre-swelling agent that increases the drug release rate. Drug dissolution profiles from the hydrogel printlets. 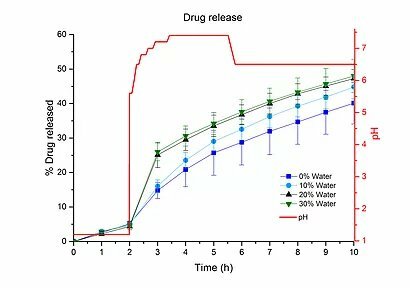 The drug released was determined in a dynamic dissolution system to mimic the conditions in the gastrointestinal tract; the red line shows the pH values of the media. SLA can become a new method for fabricating drug-loaded hydrogels with tunable mechanical and physical properties and drug release profiles. SLA avoids the risk of thermal degradation and additionally offers a way to fabricate highly complex structures with a great resolution, which can be useful to modify the way in which the drug is released.